Unexpected and amazing days just keep happening here, but this one surpassed them all. Spake when he discovered Lake Victoria, Stanley at his chance meeting with Livingstone, not even Sir Samuel Baker himself when he first gazed upon the very falls could have been happier than I was the night when I sat by the roaring flood of Murchinson Falls; all by myself, in the depth of night, with the full moon casting shadows and rainbows, and knowing that mortals who have beholden that view on their own have been few and far between. And that was neither the beginning, nor the end of the story. My grandma says that there is a happy ending to every misfortune. Indeed. As you might remember (or maybe I have not yet told that story) I was very unhappy that I have to spend the night in the village of Pakwach, in a room full of cockroaches big as my thumb and with no running water. Unhappy, not as much on the account of the cockroaches - although they did not help - but because I was really hoping to reach Paara, the centre of the Murchinson Falls Park, that very night. I wanted to wake up by the serene waters of the Nile, and instead I had to wake up next to the cockroaches and hope that the boda-boda driver I hired for th at day will show up. His somewhat delayed arrival did little to raise my spirits. But the morning was glorious and little by little I started to enjoy the ride. And then we drove into the park. Oh the blessed simplicity of the unreflective! If I had gotten my way and convinced/bribed/coerced the rangers to let me through the previous night, I would have not had experienced the most close-up and pleasant safari one can have – on the back of the motorbike, with animals within reach and no barrier between me and them. And for absolute peanuts too as technically it was not a proper safari. But that did not matter as at this hour the animals were very close to the road. On the road, in fact, and I felt a little bad for chasing giraffes, buffaloes, cobs, water-beasts, those funny plump turkey-like chicken, herons and horned antelopes off it. The elephants luckily were not on the road but a little farther for otherwise I am not quite sure who would have been doing the chasing-off. My driver already got quite scared when we stopped to admire the buffalo and the buffalo moved to admire us. They are big things. All in all, the drive was divine and I was blessing the heavens for my last-nights delay. We got to the mighty river Nile at around 8am. The next ferry was not until 9am so I had some time to explore. First, I stumbled across a warthog; we stood three meters away from each other, assessing. I don’t know what the warthog was thinking but I was certainly thinking that his fangs look sharp and my water bottle does not look like an adequate weapon. Luckily, the warthog turned around and wiggled his funny little tail away into the bushes. Convinced the interior is just far too dangerous a place to hang out I went down to the river and climbed on a small sand dune. On the other side of it bathed a small family of hippos. They were not further than ten meters away, puffing. Mesmerising. I crouched up a little closer. Mistake. One of the hippos, who was obviously the one to keep watch, suddenly snorted, turned and started charging towards me! As more and more of his huge bulk emerged from the water - the wide open snout, the round belly and finally the comically short but surprisingly fast legs – I realised its time to run. I know you are not supposed to ever turn your back on the lion but no one had ever enlightened me what the right procedure with an attacking hippo was. Luckily, mine must had been the right one for the hippo stopped after reaching the spot on which I no longer stood and turned back. I was trembling inside but turned a board smile at the laughing and cheering locals, who sat in the safe distance under the tree. I was not fleeing: I was tactically proceeding in the opposite direction. Finding neither land nor water safe enough, I decided to spend the rest of the waiting time on a tree. Picked a nice one, with sturdy branches overhanging the water, and proceeded to climb. Guess what…. Ants…maybe not very big ones but certainly not very happy with my presence…ouch… I jumped down and decided not to ever move from the safety of the ferry again. The passage onto the southern bank of the Nile was uneventful and I made it to the Red Chilli Lodge by 9.30. It was insanely hot, the air was still. I inquired with the lodge staff about the possibility of getting an afternoon boat to the bottom of the falls. The barman lazily nodded his head towards a silhouette of a man sitting in the shaded bit of the bar. He was my man, I was told, which gave me a very powerful Lord of the Rings impression. There I was inquiring about a safe passage in a tavern and being pointed towards a long-haired, shadow-engulfed ranger. I approached cautiously. 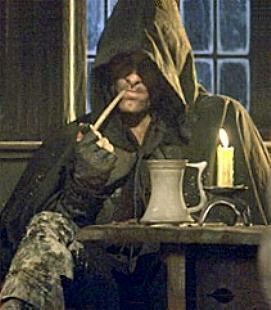 Aragorn, wait… I mean Andy, turned out to be the manager of one of the boat operators. We chatted a bit and he confirmed that it was possible to go on a morning boat to the falls, get out, walk up to the top of the falls and camp there overnight. He warned me that I would possibly the only person there. That was my plan and as long as I had beer I would be fine, I retorted. We chatted a little more. It turned out he was a hunter/ranger/angler from Zimbabwe, now managing the boats here, as Zimbabwe is no longer safe for Whites. When he heard I was going to hang out in the Lodge till the afternoon, he suggested I join the morning cruise to the Victoria Nile Delta instead. For only $40. I said I would think about it knowing full well that’s just not within my budget. We chatted more and as he rose to get the boats ready he asked if I had made up my mind about the cruise. I said I had, and that sitting in the hot sun with nothing to do is actually more appealing to me than cruising on the breezy Nile and watching exotic animals. He laughed, picked up my bag and said he would take me for free. Nice. It turned out that the group I was joining was not going on the delta cruise but was only being transported a littl e way down the river where they left the boat. Andy, Nick (local boat-boy) and I proceeded down the River to the Papyrus Delta and towards Lake Albert and the Blue Mountains of Congo. I couldn’t have been happier. I sat on the sunny roof of the boat, the wind in my hair, gazing at animals that Andy kept pointing out to me and sailing towards places of which I have read and dreamt as a child. Every now and again we would stop the engine and let the boat drift towards the shore where elephants, buffaloes or warthogs came to the water. The elephants were the best. If we remained quiet and motionless, they would just stay and splash on meters away from us. I did not want the journey to ever end. But I had the second boat to catch. Andy drove me back to the lodge and I had just enough time to grab a sandwich and some water before we had to board the afternoon boat. I said goodbye to Andy and hopped on. The second cruise was much less exciting but that was to be expected with a boat full of American middle-aged tourists in flowery Bermudas who roared with fake laughter at each of the bad jokes of our boat guide. Moreover, I think I had a mild sun-stroke so I just sat on the stern of the boat and tried to focus on the views. There were not as many animals as on the first cruise but landscape was even more to my liking. Downriver, the Nile flows lazily as it spreads on the flats overgrown with swathes of papyrus and wild hyacinths. Upriver, its banks become steeper as the ground slowly rises in gently rolling hills. Savannah gives way to the jungle, the banks seem more impenetrable and sinister; the river meanders and flows more turbulently. Yet, all this is but a prelude to the glory that is the Murchinson Falls. One can only begin to imagine what the first explorers must have felt when it rose up before them barring their way up the Nile. Its force, its beauty, its history and its remoteness make it one of the most spectacular falls there is. The boat lingered a little midstream to let the passengers take photos and then approached the left bank to let me out onto the path. I waved farewell to the astounded Americans and disappeared in the undergrowth. It is very hard to describe the feeling of fulfillment and happiness that accompanied me on my steep climb. My rucksack was heavy, I was seating like a roasted hog, but I was alone, with t he song of the waterfall resounding in my ears, climbing a path I could imagine Spake, Livingstone and Baker treading. And they had porters! I stopped often to gaze at the waterfall or, the other way, down the Nile. The sun was low and the colours were brilliant. I was not in a hurry as I wanted to arrive as late as possible to minimise the chances of meeting anyone at the top. I was also hoping to avoid the rangers for technically one should not be doing that walk unaccompanied. And the last thing I wanted on my climb was company. I arrived at the top just before sunset. To my right, a little way off, I could see one more car on the parking lot and two rangers chilling a little way off in their shack. I decided to remain unseen so I did not venture out from my path to the parking lot but remained in the thickets until I saw the last three people going back to their car. Then I took a small path that went left, bypassed the parking lot and went straight to the top of the falls, which could not be seen from where the rangers were. Success! I dropped my bag and gazed in awe and the sheer might and violence of the Nile. It looked wild and dangerous as it squeezed its entire huge body between two rocks, a mere three meters apart, and then fell with a deafening roar into a deep chasm. It spluttered and twisted. Huge waves formed and crashed on the many rocks aligning its banks, white spray rising up each time they did. The speed and turbulence of the water was intimidating. I felt the urge to swim. I was hot and sweaty from the climb and the sunstroke and the desire to cool in the water was just stronger than reason. I knew that I cannot enter the main current but I surveyed the rocks in hope of finding a cove or a bay with secondary flow. Nothing as such presented itself but there was flat rock which, thanks to a presence of a big rock in front of it, would only get submerged half the time when a bigger wave came. I put on my swimming suit and edged very slowly on all fours down that rock. The main current was just a meter away and the chasm of the fall was only some four meters downstream. Even such a foolhardy optimist could not kid themselves that they would withstand the river at that point. But as long as I was not swept from my rock onto that narrow chasm I was fine. I sprawled myself on the flat rock, dug my fingers into its crevices and edged a little further where the waves were washing over it. The feeling was beyond compare. The waves were scary but they brought coolness and sensation so divine that I did not care. I love waves and to see them crash against the big rock in front of me and then jump over to splash me on my flat rock was heaven. I sat for over half an hour there, laughing at each bigger wave and trying to get as much water over me as I could. (Mum, if you are reading stop here) The splash was always fine and easy to withstand but then the water would recede from under the wave and rush back to the main current sucking me in. It was not strong enough to wash me down as long as I held with at least with one hand to the rock. Suddenly, however, a much bigger wave came and just at the time when I was not holding on. I felt myself being dragged in. I frantically reached out for the rock, dug my heels and elbows into the rough surface. It hurt and my elbows were bleeding but I stopped sliding. I somehow felt I’ve had enough swimming for the day. I could not just pitch my tent at the top of the falls. I knew that place was not the official campsite – but I desperately wanted to be at the river. So I had to wait until it was too late for anyone to come to the falls and dark enough for them not to immediately notice my tent if they did. The latter would have been tricky – it was full moon and the place was bathed in a pale silver glow. I chose a place in the shadow of a tree and pitched the tent. I was tempted to just stay inside in case someone did come but the beauty of the river was too much to withstand. I went down and sat on the rocks. Here I was, alone, at night, beholding a view of rare beauty. The unkempt manes of waves, sharper and whiter in the light of the moon, the jagged silhouettes of the rocks, the darkness of the jungle around me and most amazingly of all, over the chasm into which the Nile fell, rainbows forming in the spray. Moon-rainbows, black and white with only a suggestion of thin ribbons of colour, but nevertheless with distinct stripes and a lovely curve. I have never seen them before and was mesmerised. I sat for a long time and just admired the view. The only thing I could have possibly wished for at the time was beer, for I have forgotten to get some at the lodge. Suddenly, I was aware of a movement in the shadows. Oh no, a guard, I thought. It was too late to run; I was perfectly visible on the bare rock in the moonlight. I waited resigned for the man to approach me. Not a guard. Andy! And not only Andy: Andy with six ice-cold beers! He said he noticed I had forgotten to take beer and, as that was my professed condition of me being alright on my own here, he thought he would check up on me and deliver the supplies. He also brought me water as he said I had taken too little. We sat on a high rock over the Nile, opened the beers and drunk in reverent silence. Then Andy asked if I had been on a path that follows the rocks over the waterfall. I hadn’t so he suggested we check it out. The path was stunning – the sand there is composed of something Andy called philosilicates which are transparent flakes of rock that glitter in the light. In the moonlight their light was fantastic and it felt like walking of fresh crisp snow. We were barefoot but it was easy to avoid obstacles and follow the path thus illuminated. It led onto a rocky platform over the other side of the fall giving a splendid view of the waters tumbling down. We reached the top of the rock, sat on the precipice facing the falls with our feet dangling over edge and drank the last beer. To Adventure, Friendship and Africa forever.